Check out what is happening around Merakey! Life Tree Pharmacy is thrilled to announce achieving Specialty Pharmacy Accreditation from the Utilization Review Accreditation Commission (URAC) with an overall score of 99.2%! As a URAC Accredited Specialty Pharmacy, Life Tree has demonstrated a comprehensive commitment to quality care, improved processes and better client outcomes. This accreditation reaffirms Life Tree’s mission to provide the best pharmacy care with the personal attention of a family pharmacy. Merakey, Life Tree Pharmacy’s parent company, is extremely proud of this significant and well-deserved achievement. This accreditation is another step towards our shared goal to integrate care and improve client outcomes. Vice President of Managed Long Term Support Services Tinnesia Snyder recently blogged about our services in Tennessee. Click here to read her post and be sure to share it on your social media pages! Some of the best-practices for delivering home and community-based services include the need to create interdisciplinary teams to deliver consumer-centric, personalized services across “flexible” service locations. For more on what a “best-practice” program looks like, we [Open Minds] had a chance to sit down with Merakey Clinical Lead Specialist Kristin Cline, and Merakey Clinical Director Kevin Kumpf, Ph.D. about Merakey’s dual diagnosis treatment services: Dual Diagnosis Treatment Teams (DDTT), which operates in Pennsylvania, and Intensive Transition Services (ITS) in California. Click here to read more. Administrative Professionals' Day, which falls on April 24 this year, highlights the work of secretaries, administrative assistants, receptionists, and other administrative support professionals. Each year, administrative professionals are recognized for their skills, loyalty and attributes every office depends on. Merakey thanks all the Administrative Professionals throughout the organization. Our staff and individuals receiving services are grateful for your ongoing support, commitment, and hard work! On April 8, Merakey Education and Autism Services hosted their “Champions for Change Conference: Biomedical and Neuroscience Treatments for Autism Spectrum” in Monroeville, PA. “The conference is one of the ways Merakey connects nationally recognized speakers with those working with individuals on the autism spectrum and the community to share current approaches to foster understanding and inclusiveness for all”, said Merakey Vice President of Operations Rebecca Mann. Shelley Hendrix, Different Beat Consultants, LLC, presented at the conference and addressed “MTHFR Genetic Mutations and Variations.” Shaun Eack, Ph.D., University of Pittsburgh Associate Dean for Research and Professor of Social Work, shared insights into “Cognitive Enhancement Therapy for Adults with Autism.” Merakey Therapeutic Support Services employee, Bridget Courtright, received the Making a Difference Award. Bridget has worked with Merakey for 20 years and was nominated by a coworker for the award. Bridget works every day to ensure that the families she works with receive the best care. Congratulations to the Adults with Autism program in Chester County, PA on their recent re-accreditation by the Commission on Accreditation of Rehabilitation Facilities (CARF). Thanks to the leadership and dedication of Director of Adult Autism Services Cindy Hennessy the program will receive a three-year accreditation, the highest level awarded by CARF. The CARF surveyor noted that he was very impressed with Merakey leadership, program staff and the quality of services provided to our individuals. Thank you for putting your heart and soul into exceptional care and services! Many employees have been with Merakey for quite a number of years, and they deserve a special spotlight for all their hard work and dedication! Look for more employee spotlights in The Pulse, on digital signage, and on Facebook! Margaret has several favorite memories during her time with Merakey. She has grown up with several of the individuals and enjoyed a lot of laughs and smiles together. Merakey has given Margaret a sense of purpose to care for others who need assistance. Working with Merakey has taught Margaret to not judge a book by its cover. She hopes Merakey will continue to hire loving and devoted staff to carrying on the best care for the individuals they serve. In honor of Autism Awareness Day on April 2, Merakey locations across the company participated in Autism Speaks' "Light It Up Blue" campaign! Merakey staff at the Ewings Mill Road Allegheny Valley School office dressed up in blue to celebrate autism awareness on April 2. The staff in Schuylkill Mountain wore blue in support of autism awareness. On April 2, the staff and students at Merakey Education Center in Chambersburg, PA celebrated Light It Up Blue in support of World Autism Awareness Day. Students did an activity creating their own individual puzzle piece to illustrate who they are. Students and staff at the Merakey Education Center in East Freedom, PA participated in Light It Up Blue for World Autism Awareness Day on Tuesday, April 2. Everyone wore blue to show their support. The teachers prepared activities to share in their classrooms: In Ms. Denise's classroom, students created a puzzle piece by writing or drawing something unique about themselves; In Ms. Kim's room, students decorated puzzle piece shaped cookies with icing and sprinkles, and then enjoyed their creations with some chips and juice; In Ms. Pam's classroom, students enjoyed a story called "It's Okay to Be Different" followed by a sensory craft with shaving cream. All the students and staff enjoyed the afternoon of fun activities for Light it Up Blue. Thank you for showing your support and commitment to individuals that Merakey serves! You can see additional photos from celebrations and events on Merakey's Flickr page by clicking here. Beth’s favorite memory at Merakey happened last year, when her dedicated team and individuals in our care threw her a surprise 30th anniversary party. Beth greatly appreciated their kindness and was very touched by the festivities. Merakey has taught Beth that with persistence, focus and determination you can achieve your goals. She also believes that contributions with a purpose have a positive impact on others. Thank you, Beth, for putting your heart and soul into exceptional care and services! The Merakey Talent Acquisition Team, Quincy Stephens and Mary Robinson, attended Diversity and Inclusion in Practice, CFO Leadership Council on March 21, held at Ballard Spar in Philadelphia, PA. In addition to Quincy, guest panelists included Virginia Essandoh, Chief Diversity Officer, Ballard Spar, and Carol Watson, General Manager, Hotel Palomar. Deirdre McAleer, Marketing Executive, Bank of America and Merrill Lynch served as Moderator. Panelists shared their personal and professional experiences in their perspective field, and their companies’ best practices for Inclusion and Diversity. This included revised recruiting practices to include hiring diverse individuals, as well as individuals with different experiences and backgrounds in order to retain employees. Quincy stated, “It’s important to reach out to specific neighborhoods to see diversity in action” as well as “to Infuse diversity into your company by finding value in individuals you bring into your organization.” Essandoh mentioned the benefits of an Employee Benefits Programs that allows employees mentorship and sponsorship opportunities. The panel was passionate about the success of their organizations push for diversity and inclusion and recognizes the benefits diversity brings. “Allow yourself to be uncomfortable”, Quincy added. On April 2, in celebration of World Autism Awareness Day, Merakey partnered with Philly Pretzel Factory in Delaware County, PA to formally launch the sale of specialty Merakey bracelets and pretzels in the shape of autism ribbons. The event location is one of eight Philly Pretzel Factory stores across the region that will have the items available to purchase for $1 throughout the month of April. Proceeds from the sales will support Merakey's Education and Autism Services. CEO Joe Martz was joined by Merakey Foundation Board Chairman Mike Mitchell and Merakey Foundation Junior Board President, Meghan Nolan to speak about the positive impacts the sales would bring to the Foundation as well as the awareness this initiative will have on the autism community. Individuals from local Merakey Education Centers also attended the event to help release blue balloons and to learn how to make pretzels. Merakey would like to thank Philly Pretzel Factory for this amazing partnership/opportunity. Click here to check out images from the event on Flickr. It’s not too late for you to make a difference and support Merakey Education and Autism Services! Visit any of the following locations during the month of April to purchase your own Merakey bracelet and autism ribbon shaped pretzel! As we approach our 1 year anniversary as Merakey and celebrate 50 years of providing exceptional care and services, click below to learn how we got our new brand! Merakey Parkside Recovery located at 5429 Germantown Avenue in Philadelphia, recently received EPIC EBP Program Designation for Prolonged Exposure (PE) in their Substance Use Disorder Services by the Evidence-Based Practices and Innovation Center from Community Behavioral Health. Merakey’s status as an EPIC EBP Program Designated Provider means that the Philadelphia location is now recognized by the city as a provider of evidenced-based practices in Prolonged Exposure, and it allows Merakey to better support individuals who may struggle with Post Traumatic Stress Disorder. With many people who have addition-related disorders, they also have comorbid psychiatric challenges. PTSD can be a precursor to an addiction and can often lead many individuals to displaying negative coping patterns. Prolonged Exposure has been shown to be effective at treating PTSD symptoms. By reducing symptoms, staff members can work better with the individuals to address their coping mechanisms. Prolonged Exposure, an intensive therapeutic treatment for PTSD, focuses on habituation, where controlled exposure to anxiety inducing stimuli over time can reduce the anxiety experienced by the individual. Many individuals with significant substance use histories have a history of trauma and PTSD. Staff members trained in this therapeutic model include Hava Weber, Judith Bigley, Robert Dilenge, and Cristina Marino. Congratulations to these employees who have this additional expertise and to Merakey Parkside Recovery for receipt of this designation. Taryn’s favorite memory at Merakey is going on vacations with the individuals she supports. It was exciting to see the smiles on their faces and for them to be engaging in all prepared activities. Merakey has taught Taryn to understand change, remain teachable, walk with integrity and implement the mission statement. Taryn hopes Merakey will continue to embrace the core values and to further educate staff on meeting every need of the individuals in our care. 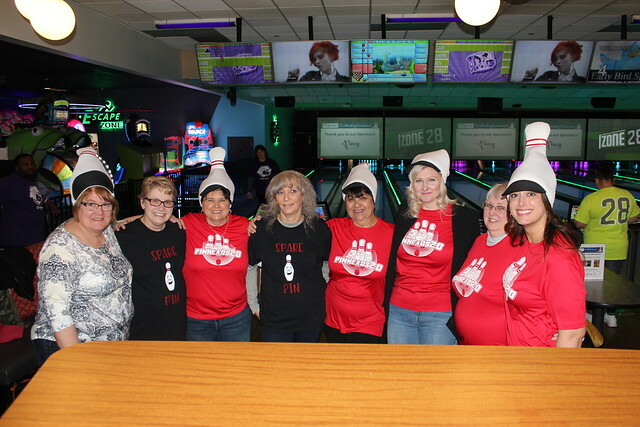 Bowling alleys in Pennsylvania, Michigan, Virginia, Delaware and Louisiana were filled with hundreds of Merakey employees, individuals we serve, supporters, and friends for the Merakey Foundation’s 5th Annual Bowling Tournament this past Friday, March 8. This special event brings the organization together as a way to enhance the employment experience and to raise money for Merakey programs. During the event, many showed tremendous spirit and pride by wearing t-shirts and glow in the dark bracelets in the Merakey colors. The event opened with a video message from CEO Joe Martz where he thanked everyone for their support and generosity. And, Facebook was all a buzz with live videos taken throughout the day. Be sure to check out the videos on our Facebook page! Visit merakey.org/media.html to view media coverage of the event. Check out pictures from all locations on Flickr at https://flic.kr/s/aHsmwwC9FN. Click below to learn about the incredible journey and success of one of our amazing individuals, Thomasina. Thomasina, winner of the 2018 Self-Advocate of the Year Award by Pennsylvania Advocacy and Resources for Autism and Intellectual Disability (PAR) has been working at The Graham Company in Philadelphia, Merakey’s insurance and risk management partner since last May. In less than a year, Thomasina has proven herself to be a valuable asset and contributing member of their workforce. Merakey and The Graham Company are very proud of Thomasina and all of her accomplishments! Governor Tom Wolf recently designated March 2019 as Developmental Disabilities (DD) Awareness Month. Click here to view the full proclamation. Lynette’s favorite memory over the past 32 years was her helping a family feel comfortable placing their loved one into the great care at the Verree location. This was especially meaningful because it reflected the important lesson of caring with compassion she has learned at Merakey. The core value that means the most to Lynette is integrity, because she believes in doing the right thing even when no one is looking.